→ Accumulation of cerebrospinal fluid in a foal’s brain. Fluid exerts pressure on brain and skull. Can lead to complications during birth → endangers mare. → Only animals with two copies of the variant (hcp/hcp) are affected. Animals with only one copy of the variant (N/hcp) are clinically normal carriers. N/N normal. The horse has no copies of the genetic variant causitive for hydrocephalus and therefore cannot pass it on to its offspring. N/hcp a carrier. The horse is clinically healthy. It has one copy of the genetic variant causitive for hydrocephalus, which will be passed on to its offspring with a probability of 50%. hcp/hcp affected. The horse is affected and will not live long enough to reproduce. Carriers may be bred to normal animals (N/hcp x N/N) without any risk of producing affected offspring. The offspring should also be tested before breeding to determine if they are carriers or normal. Breeding two carriers (N/hcp x N/hcp) is not recommended due to the possibility of 25% of the offspring being affected. Test information: This test detects the change of a single basepair in exon 12 of the B3GALNT2 gene. Ducro, B.J., Schurink, A., Bastiaansen, J.W., Boegheim, I.J., van Steenbeek, F.G., Vos-Loohuis, M., Nijman, I.J., Monroe, G.R., Hellinga, I., Dibbits, B.W., Back, W., Leegwater, P.A. 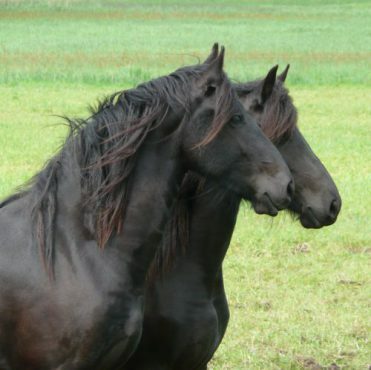 : A nonsense mutation in B3GALNT2 is concordant with hydrocephalus in Friesian horses. BMC Genomics 16:761, 2015. Pubmed reference: 26452345. DOI: 10.1186/s12864-015-1936-z.